When nearly five full weeks late in posting pictures of a build designed for a specific date, it seems that an explanation for the delay is in order. However, excuses don’t seem to matter given that — much like the long, unintentional hiatus on the next installment of the Trumplestiltskin Saga — pictures for the post were ready quite a while ago. There is no good excuse; just laziness. So, without further preamble, the 2018 Halloween Display. 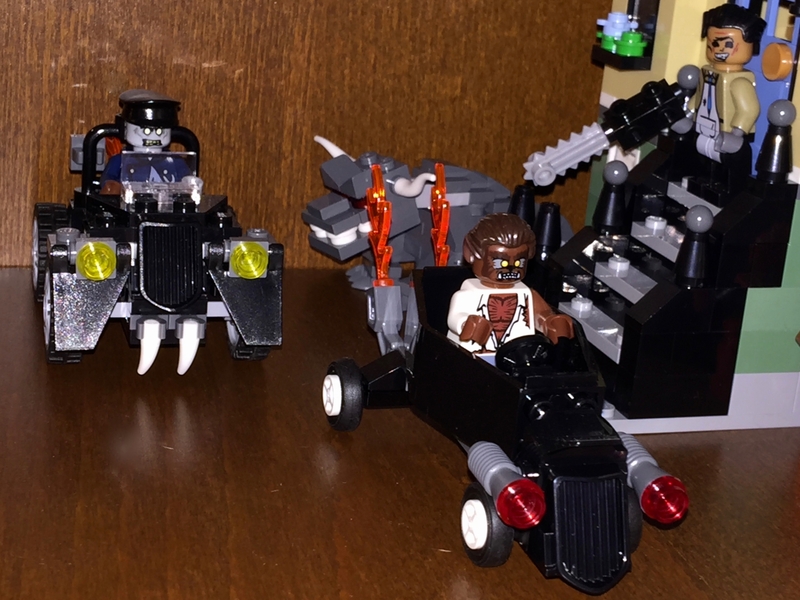 Obviously, Ghostbusters served as the primary inspiration for the build. 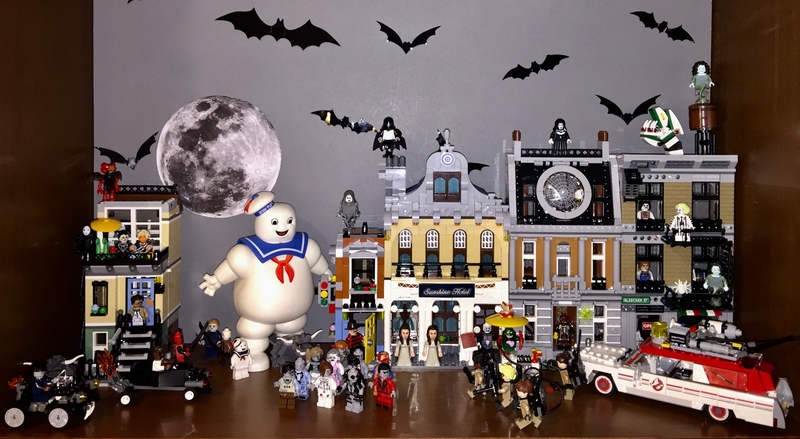 The Playmobile Stay Puft was nearly perfect for the display. LEGO designed some nice Ghostbuster sets, but this was an element they were sorely lacking. The LEGO Dimensions Stay Puft minifigure is cute, but it just utterly lacks the necessary heft. However, because this is merely Ghostbusters-inspired and not an attempt to recreate a scene from any of the film, mini-Stay Puft made it into the set as Son of Stay Puft. It was Take Your Child to Work Day, complete with service animal! Of course, Slimer needed to appear as well. In a twist, I went with the female Ghostbusters rather than the original cast. I actually enjoyed the 2016 reboot, and if I trigger a right-wing fanboy (or multiple fanboyz) then I feel I’ve done something rewarding. 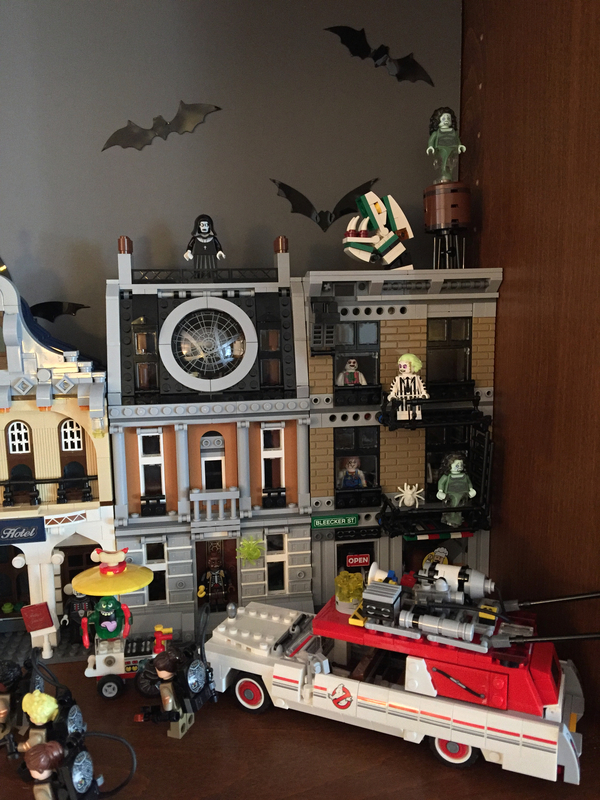 While Stay Puft towers over the display and the Ghostbusters team receives prominent placement, the other major element to the build was the use of a horde of horror movie villains. Because of how they maintain their brand, LEGO will never create sets and figures for R-rated films (the fact that there is an official LEGO Deadpool minifigure is just a wonderful fluke that occurred before Deadpool cursed a blue streak into our hearts.) However, there are plenty of Asian toymakers who are happy to risk of the wrath of Hollywood by selling unlicensed LEGO-compatible characters from a large array of movies. I won’t lie; creating an army of horror movie miscreants was fun. Early in the design of this year’s display, I contemplated giving them a more active role in the scene, but ultimately decided that a scene of true horror-movie inspired mayhem can wait for a future build. For this year, I was basically content to let them all gaze upon the mayhem from doors, windows, and dark corners. However, I wasn’t entirely content to simply let all the villains contentedly stand back and watch. There were a few figures who just needed to see some action. The pose could and should have been more creative. This is something that will almost certainly be revisited in a future Halloween display. Although pleased with the overall final result, there were a couple minor issues that I felt detracted aesthetically. Primarily, I wasn’t able to satisfactorily backlight the display in the same way I did with last year’s display. 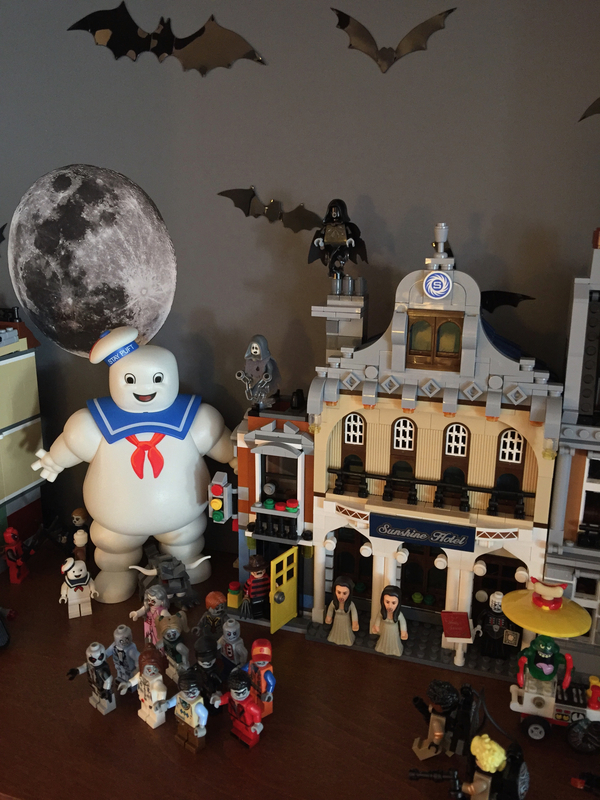 In addition, the shelf showed how much the lighting near the bookcase reflected off the buildings and a number of the figures (especially the large Stay Puft). The good news is that I solved the shelf glare issue for the upcoming Holiday display, which is nearly complete. Looking past the end of the holiday season, tentative plans are already in place for next year’s Halloween display. I can’t wait. 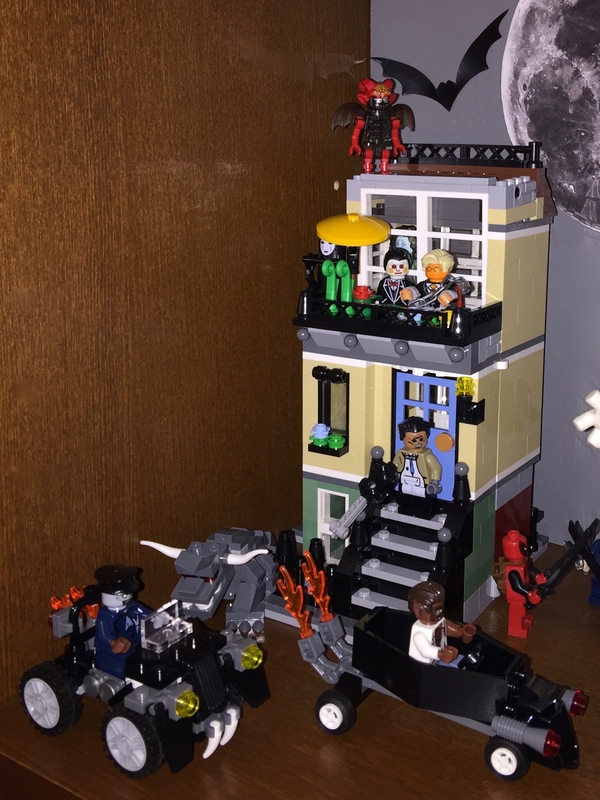 This entry was posted in Halloween & Holiday Builds. Bookmark the permalink.